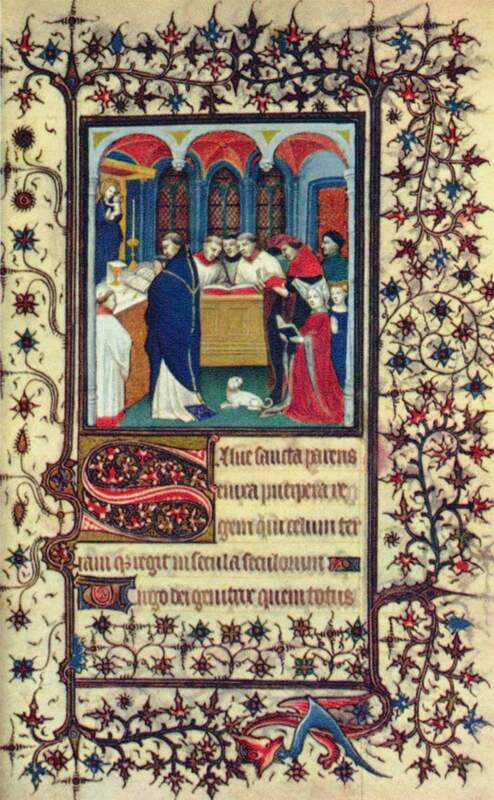 A French book of hours from around 1400. Pop quiz if you read the last post: what style is this? Chowdry, Anita. “Precious Pigments and Gold with Staff from the Bodleian Library.” Journeys with Pattern and Colour. Anita Chowdry, 02 July 2014. Web. 26 Feb. 2015. <https://anitachowdry.wordpress.com/2014/07/02/precious-pigments-and-gold-with-staff-from-the-bodleian-library/>. Chowdry, Anita. “How to Paint with 24 Carat Shell Gold.” Journeys with Pattern and Color. Anita Chowdry, 23 Feb. 2015. Web. 26 Feb. 2015. <https://anitachowdry.wordpress.com/2015/02/23/how-to-paint-with-24-carat-shell-gold/>. De Hamel, Christopher. The British Library Guide to Manuscript Illumination: History and Techniques. Toronto: University of Toronto, 2001. De Hamel, Christopher. A History of Illuminated Manuscripts. London: Phaidon, 1994. Helm-Clark, Catherine. “Azure.” Tharasia’s SCA Webpage. 2001. Web. 16 Feb. 2015. <http://www.rocks4brains.com/~cat/azure.pdf>. LeMay, Marie-France. Medieval Manuscripts: Some Ink and Pigment Recipes. London: Bernard Quaritch, 2010. Special Collections Conservation Unit of the Preservation Department of Yale University Library. Williams, Elizabeth. “Medieval Inks.” Pen and Parchment: Drawing in the Middle Ages. The Metropolitan Museum of Art. <http://blog.metmuseum.org/penandparchment/2009/07/14/medieval-inks/> West, Vicky, and Christina Duffy. “Recreating the Medieval Palette.” Collection Care Blog. British Library, 06 May 2014. Web. 15 Feb. 2015. <http://britishlibrary.typepad.co.uk/collectioncare/2014/05/recreating-the-medieval-palette.html>.